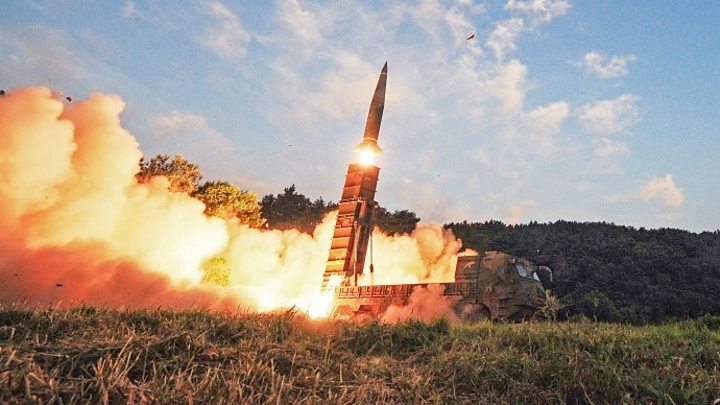 But within a day, the White House and State Department had reiterated the administration's hard line, stressing that North Korea must first commit to abandoning its nuclear weapons. Speaking at a policy forum in Washington DC on Tuesday, the secretary of state told the audience: "We've said from the diplomatic side we're ready to talk any time North Korea, would like to talk, and we're ready to have the first meeting without precondition." He added: "Let's just meet and let's talk about the weather if you want and talk about whether it's going to be a square table or a round table if that's what you're excited about." In response to the remarks, an unnamed White House official told the Reuters news agency on Wednesday: "The administration is united in insisting that any negotiations with North Korea must wait until the regime fundamentally improves its behavior. "As the secretary of state himself has said, this must include, but is not limited to, no further nuclear or missile tests." And Heather Nauert, a spokeswoman for the State Department, tweeted to reiterate the administration position that preconditions apply regarding North Korea's nuclear programme. She said: "Our policy on #DPRK has not changed. Diplomacy is our top priority through our maximum pressure campaign. "We remain open to dialogue when North Korea is willing to conduct a serious & credible dialogue on the peaceful denuclearization, but that time is not now." In August, then-White House advisor Sebastian Gorka criticised Mr Tillerson after the secretary of state attempted to moderate President Trump's remarks on North Korea. "The idea that Secretary Tillerson is going to discuss military matters is simply nonsensical, it is the job of Secretary Mattis, the secretary of defence, to talk about military matters," Mr Gorka told the BBC. Then in September, after Mr Tillerson said he had established direct lines of communication with Pyongyang, the president accused the secretary of "wasting his time". "Save your energy Rex, we'll do what has to be done!" Mr Trump tweeted. 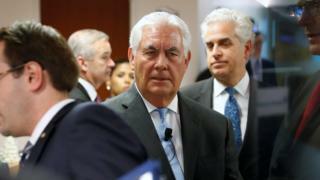 Mr Tillerson has also defended the Obama administration deal to curb Iran's nuclear ambitions, which Mr Trump has railed against and sought to overturn.